Not content to let the nation celebrate the Thanksgiving holiday weekend in peace, CNN and Trump were back at it, twisted together in a grotesque display of dystopian linguistic coitus. So let’s just lay this vile relationship bare for what it is: Trump and CNN are codependent partners. 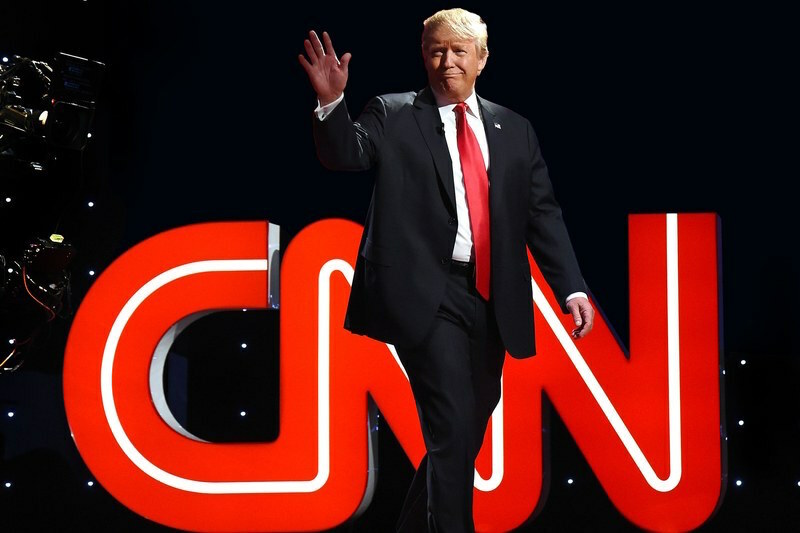 CNN made Trump, who intentionally or not returns the favor by undeservingly elevating their journalistic street creds while driving their viewership and mad web click numbers. We’re living through the CNN presidency. Verizon’s Huffington Post made the editorial decision to cover this chapter of the Trump Show in its entertainment section, along with Kardashian updates and celebrity rehab stories. Right-wing spin outlets—all geared up to frame right-wingnut Ted Cruz as presidential material up there with the great ones like Scandal’s Fitzgerald Grant III—suddenly had their scripts shredded. Not quite knowing what to do with an unapologetically hedonistic, conspicuously womanizing, non-Christian, narcissistic, trashy showman, they initially fumbled and sputtered, continuing to cover poll-leading candidates and policy debates. But there was CNN. Early in the primary season CNN was fading faster than John Kasich, nearing the end of a long slide into irrelevance and financial failure. A study of media coverage in the year leading up to the presidential primary decision by the Harvard Kennedy School’s Shorenstein Center on Media, Politics and Public Policy, now a go-to source for journalists and wonks revisiting the rise of fascism in the United States, didn’t examine or even mention CNN. CNN, however, saw Donald Trump for exactly what he was—a successful showman, like the late Charles Manson. CNN ran with Donald Trump and saw an immediate bounce it their viewership and internet activity. The rest of the corporate media scrambled to catch up with the now resurgent CNN, which was stealing their viewership eyeballs and clicks. Like Martians impregnating human virgins, Trump sells. New York tabloids knew this a generation ago. Here Trump actually alludes to an accurate reality, that CNN International has always been much more of a news organization, providing more complete and balanced coverage of global events, than its domestic operation. The reason for this is that in order to compete in the global media market, CNN was forced to up its game and critically cover the US in the world. This meant, for example, reporting on such stories as civilian casualties in US wars, which were being reported by their international competitors such as the BBC and Reuters, but not so much by their domestic competition. Of course Trump had to frame his compliment with his now branded “I’m rubber, you’re glue” accusation of “fake news,” but for the network, this was Trump begrudgingly acknowledging their market penetration, which is their bread and butter, while simultaneously lobbing some red meat holiday name-calling to his own base. And CNN got to lob one back, seemingly launching a new branding campaign, tweeting, “It’s not CNN’s job to represent the U.S to the world. That’s yours. Our job is to report the news. #FactsFirst.” As of press time, this free ad scored over 64,000 retweets for CNN, making this friendly little skirmish a win-win for both CNN and Trump, as usual.